Other genetically modified foods (eg: corn and soy) have been linked to increases in allergies, or further aggravating pre-existing conditions such as autism. Fish oil has been tried for preventing heart disease or stroke. The future cost to human health from biotech fish consumption may end up being greater than the perceived benefits of increasing fish yields. 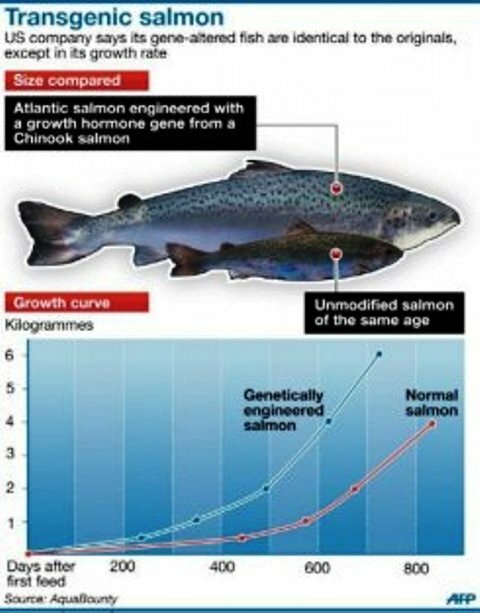 With shorter maturation periods from youth to adulthood than regular salmon, the Chimera hybridized salmon will satisfy the ever-growing demand for salmon globally. Further effects from these complex GMO foods will open the door to mutated super viruses and bacteria immune to antibiotics or vaccines, leading to potential pandemics. Starting with Monsanto’s downwind cross pollination contamination of non-GMO organic crops on land with corn, it can now also be put in our seas with these super fish. Cross-genetic contamination of the Franken Salmon in our oceans may abrogate the naturally indigenous salmon populations and possibly harm other fish species as well. Remember as the old adage or saying goes “you are what you eat”. Eat healthy, no GMO’s, only organics and support your local community organic grocer or farmers.